1870s. 2-storey, 3-bay banking house. Snecked squared red (Torridonian) sandstone rubble to principal elevation; random rubble to sides and rear; red sandstone ashlar dressings; droved ashlar quoins; string and cill courses to S and E; moulded and stop-chamfered openings. Carved entablature over door; full-height canted bay; piended breaking eaves dormers; overhanging eaves with moulded stone brackets; moulded bargeboards. 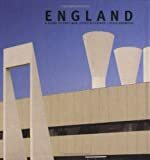 S (PRINCIPAL) ELEVATION: slightly advanced piended bay to left with full-height canted 3-light windows. Central timber panel door; moulded doorway with Gothic detailing; entablature above with dentils, quatrefoils and ball finial capped consoles(forming part of string and cill courses). Tripartite window to right at ground floor; plastic and perspex bank signage (2003) above. Central breaking eaves piended dormer with round-headed window at 1st floor; bipartite round-headed windows to right-hand bay. Flat-roofed masonry porch recessed to right with wide hoodmoulded doorway, moulded parapet and stone finial recessed to right. E ELEVATION: half-piended gable end. Central flat-roofed stone porch, hoodmoulded window; flanking ground and 1st floor windows. Single storey, lean-to random rubble service wing slightly recessed to right. N (REAR) ELEVATION: asymmetrical; piended gable to right. Full-width single storey lean-to service extension, central glazed and timber door, 2 windows to left, 1 window to right. 3 1st floor windows to centre. W ELEVATION: pitched bay to right. Later 20th century piended conservatory to centre; flanking ground and 1st floor windows. Single storey, lean-to random rubble service wing slightly recessed to left with window. Plate glass in timber sash and case windows. Half-piended roof and piended dormers; single pitched bay to W; corniced ashlar stacks (1 to ridge one to E gable); octagonal clay cans; cast-iron rainwater goods with stylised Gothic decoration. INTERIOR: original layout mostly intact. Highly decorative cornices to banking room and public rooms of private residence at ground floor level. Front vestibule with encaustic tiles, glazed and timber door with sides lights. Central scale and platt staircase with mahogany handrail and decorative cast-iron balusters. Original doors throughout. Most original firplaces have been removed. STABLES (GARAGE): single storey, 4-bay rubble-built former stables with slated half-piended roof built into E boundary wall. W elevation: 2, 2-leaf timber boarded doors to left; 2 later windows (replacing doors?) to right. 2 cast-iron roof lights. S elevation: large 2-leaf timber boarded doors. BOUNDARY WALLS, GATEPIERS AND RAILINGS: coped squared rubble wall to S; low coped wall with cast iron railings, floriate finials and 5 square-plan gatepiers on square bases with trefoil carved gablet caps; random rubble wall to E.
This attractive banking house was originally built as a branch for the Caledonian Banking Company whose head office was in Inverness. 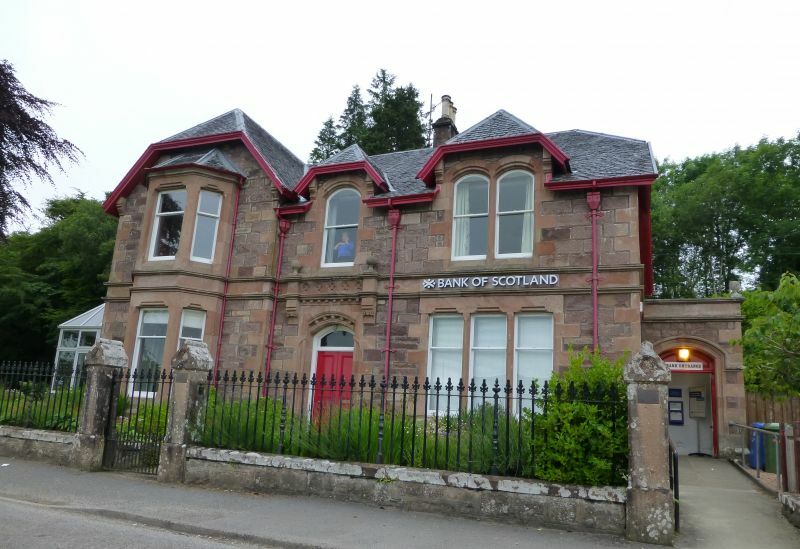 The Caledonian Bank first opened a branch in Lochcarron in 1865, initially operating out of commercial premises belonging to J & K Mackenzie & Co and remained at this location for a number of years. The Board Minutes from March 1870 state that the lease on the commercial premises had been renewed in 1870. OS map evidence shows a purpose-built banking premises on this site to the W of Lochcarron by 1880, therefore the building was probably erected during the mid 1870s. Plans dated 1903 by Inverness architect, Phineas J Macbeth are found in the HBOS archives but these documents do not provide any new information. The Caledonian Bank was taken over by the Bank of Scotland in 1907. The layout of the bank and the house is original; thus the Halifax Bank of Scotland occupies half of the ground floor and the rest of the house is occupied as a single private residence. The building is located in a prominent position on the main road facing a playing field, formerly the lands of Dalchuirn. The half-piended roof design is a feature of a number of other large houses in the parish, such as Achnashellach Lodge and Stables, Attadale House and Tullich Farm (see separate listings).